Duplex S31803 Tubes, UNS S31803 Duplex Steel Pipes, Duplex 2205 Pipes, ASTM A790 Duplex Steel WRN 1.4462 Seamless Pipes & Welded Tubes Supplier & Exporter in India. We manufacturer & export these duplex steel pipes & tubes in form of Round Pipes/Tubes, Square Pipes/Tubes, Rectangular Pipe/Tubes, Coiled Tubes, “U” Shape, Pan Cake Coils, Hydraulic Tubes. These S31803 duplex steel pipes & tubes are widely used in construction, chemical, cement and petrochemicals industries & other industrial application as well. Our UNS S31803 Duplex Steel Pipes and Tubes are stronger and harder as compared to normal steel. 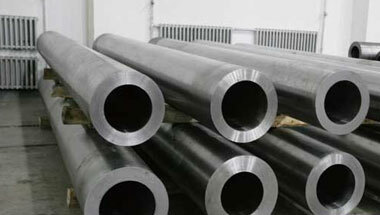 However, these UNS S32205 Duplex Steel Pipes and Tubes are not as challenging to corrosion as stainless steel. These S31803 duplex steel pipes and tubes are resistant to corrosion which increases their functional life. They are characterized by high chromium (19 % to 32 %) and molybdenum (up to 5 %) and lower nickel contents than austenitic stainless steels. The properties of these duplex stainless steels are achieved by means of having an overall lower alloy content than similar-performing super-austenitic grades, making their use cost-effective for many applications. Meanwhile, we as well offer these pipes and tubes in customized thicknesses and sizes as per the précised requirements given by our valuable customers in national and international standard quality of raw materials. Duplex Steel S31803 ERW Pipes, Duplex 2205 Seamless Tubes, Duplex S31803 Welded Pipes, Duplex S31803 EFW Tubes, Duplex S32205 Seamless Pipes Manufacturer in India. Tunisia, UAE, United States, Azerbaijan, Africa, Egypt, Venezuela, London, Peru, Saudi Arabia, Houston, Germany, Ghana, Dubai, Mozambique, Thailand (Bangkok), Malaysia, Canada, Uganda, Nigeria, Angola, Indonesia, Chine, Brazil, Bahrain, Trinidad and Tobago, Italy, Sri Lanka, Israel, UK, Algeria, New Zealand, Turkey, Democratic Republic of the Congo, Australia, Russia, South Africa, Argentina, Vietnam, Ethiopa, Jordan, Kazakhstan, Colombia, Mexico, Morocco, Iraq, Cameroon, Kuwait, Iran, Sudan. Beirut, Brazzaville, Amman, Abu Dhabi, Casablanca, Kaduna, Lagos, Maputo, Lubumbashi, Nairobi, Harare, Hong Kong, Dammam, Colombo, Yaoundé, Omdurman, Doha, Mogadishu, Abidjan, Addis Ababa, Maiduguri, Conakry, Fez, Bethlehem, Singapore, Cape Town, Rabat, Lusaka, Port Harcourt, Tel Aviv, Cairo, Kano, Dubai, Freetown, Pretoria, Mbuji-Mayi, Subra al-Haymah, Alexandria, Dar es Salaam, Tehran, Port Elizabeth, Tripoli, Benin, Manama, Algiers, Istanbul, Luanda, Bamako, Durban, Soweto, Ouagadougou, Ibadan, Johannesburg, Giza, Zaria, Muscat, Jeddah, Bulawayo, Kinshasa, Khartoum, Byblos, Jerusalem, Douala, Riyadh, Kolwezi, Antananarivo, Dakar, Sharm el-Sheikh, Data from the UN, Mecca, Kampala, Accra, Aqaba, Cairo, New York.